Normally when we do CNC routing, we are also doing printing, but this job was a little different. 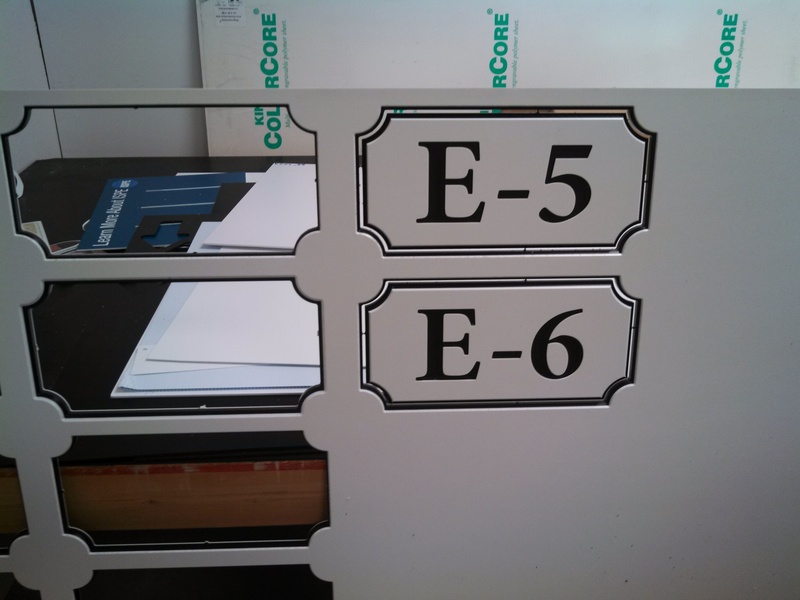 We custom cut the numbers for a condo association that heard we had a CNC router. The material is a hugely rugged 1/2″ thick material called Color Core. In this case, it has a white face on either side, and a solid core of black. It comes in a number of color choices, however. The material is a very tough high density polyethylene, and will last for centuries. Their old wooden unit number signs had gotten pretty lousy after about 20 years. Since the numbers are cut into the plastic, there’s no paint to flake off! The next time you need a set of numbers for apartments, condos, or even industrial locations, give this material a try! This entry was posted in die cut signs and tagged apartment numbers, cnc cut signs, condo numbers, die cut signs. Bookmark the permalink.